Well, the 2013 Master Diver Reunion (MDV) is in the history books. It was well attended and, as promised, Ray Starining and his group cooked up more crawdads than everyone could eat. There were a bunch left and people were taking home. Went well with the hot dogs. Saturday, the food was excellent, the beer good and the company outstanding. I haven't received many pictures yet to share with you, but I do have the MDV Group Photo that was taken by Bernie Campoli. The bells were tolled and the names were read of the MDVs who left us during the year to be with the Great Master Diver in the sky. Will post more photos once they are received. Learned yesterday from Joe Gray that Friday evening, May 10, 2013, Ray Straining will be cooking up crawdads as well as hot dogs with associated condiments. Of course, there will be beer and soft drinks. Friday night get-together will be at the same location as Saturday's reunion - at the Base Marina. The Base Navy Lodge has made available to the MDV Reunion 12 (twelve) additional rooms. Info to contact is below. Base Navy Lodge: For room reservations, email anne.sawyer@navy.mil with the following information: Name, Rate/Rank, Address, # of People (Adult / Children) and Credit Card # and reference the Master Diver Reunion or Call (850) 234-4217/4556. You MUST reference the Master Diver Reunion! The deadline for registering at the Lodge is 6 May 2013. It is still not too late to order your MDV Reunion T-Shirt. Just enclose $12.00 each for the number of shirts and size you would like. Make check payable to Joe Gray and mail to 314 Prudence Lane, Panama City Beach, FL 32408-5540. Please order one now if you want one as “No shirts will be mailed after the Reunion”. Lastly, if you haven’t registered yet, please do so so Joe can plan on attendance……also send in your 25 bucks. Joe Gray spoke with the La Quinta management and got a $79 per night rate for those wishing to attend the Reunion. The information is below for the property. 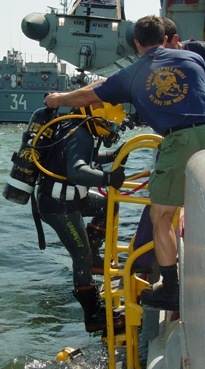 When you call, be certain to tell them you will be attending the “Master Diver Reunion” being held on the Naval Support Activity at the Marina. MDV Ball Caps for Sale -- Ernie Caltenback will have Master Diver Ball Caps for sale at $7.00 apiece. Good deal for you MDVs. Better plan on stocking up on them. All Master Divers are cordially invited to the tenth biennial Master Diver Reunion. Visit old friends, talk of days gone by and just have an enjoyable day with fellow shipmates. Food and refreshments will be plentiful at $25.00 per person. Please make checks payable to Joe Gray and mail to: 314 Prudence Lane, Panama City Beach, FL 32408-5540, NLT 15 April. If you have any questions, call (850) 258-7353 or email me at josephgray81@yahoo.com We plan to do a Tolling of the Bell Ceremony for our shipmates who have passed on. Our last reunion covered many of our deceased shipmates; so if you know of anyone who has passed on, please let us know so that we can honor them at our ceremony. This year we will be requiring all attendees drinking beer and/or eating to wear a name tag. We will be passing out the name tags on Saturday. If you know of any other Master Divers that I have missed inviting to our reunion, please invite them and give them my apologies. We have tried to locate everyone so they may know what’s going on, but you know how that goes. Also, if you have anything you would like to see or have at our reunion, please let us know so we may implement it. We will be purchasing MDV reunion shirts again. So, if you want one or more of these fine souvenirs, just enclose $12.00 each for the number of shirts and size you would like. Make check payable to Joe Gray and mail to the above address. Please order one now if you want one as “No shirts will be mailed after the Reunion”. If you have not received a complete listing of Master Diver’s names and addresses, please let me know and I will send you one. If you know of one of our shipmates who is not on our list, please send me their address and phone number, if they don’t mind, and I will add them to our list. Hotel Info: You can try accessing www.talkingphonebook.com for hotels/motels. Base Navy Lodge: For room reservations, email anne.sawyer@navy.mil with the following information: Name, Rate/Rank, Address, # of People (Adult / Children) and Credit Card # and reference the Master Diver Reunion. Call (850) 234-4217/4556. (NOTE) Navy Lodge Rooms MUST be reserved 30 days prior to our reunion or they will go back to first come – first served. Base Marina Info: If you are in need of a campsite for an RV (I have two RV sites up front – call me for info on them), the Marina on base has a nice camping area. Also, they have Cabins (No Pets) you can rent. Their phone number is (850) 234-4402 for reservations. P.O.C. is Noel. You MUST reference the Master Diver Reunion! P.S. Friday evening there will be some early beverages and munchies starting at 1700 at the Marina for those who come into town early.